Its just a tiny window that I have to blog into right now. I have loads of stuff to do and the worst part is i am not very enthusiastic about it . Actually I am not very enthusiastic about going to pakistan either. I dont like it there. I had plans of writing down a list of the reasons why, and post it here. But then most of the people know and its too much and too complicated. In simple words I hate that place. Amongst the usual, taping cartons, cleaning clothes (after searching them), burning media, collecting what needs to be thrown and what needs to be given, there is some other non travelling related unifinished business. Most of which, i think, will be left that way. From the ones that I need to get done, is definitely www.MEcampus.com articulation. A further education directory. do check it out once its done, not completely but to the extent that will be put up in the recent future inshALLAH. I had left it pending for so long, I feel bad its not done yet. But the procrastinator I am, you cant expect any better. Oh, and yeah i need to watch War of the Worlds. Steven Spielberg is a magician. As there is not much that I can think of writing right now I might as well give my brief account of the AUS GRADUATION CEREMONY. Firstly, coz am a postponer (i know that isnt a word but sthu), I wait for the last day to inform the teachers i want to come. Thereby inducing mrs. Ganesh's wrath on that angel of a person Mrs. Devakran. She is one of the most SPECIAL teachers to me and I am so sorry for being such a pain. Then she tells me to wear white pants. So now i am rajnikant :P. To make it worse, the pants are baggy. So now i am WEST SIDA RAJNI - CANT! And I did not know what to wear as a shirt, so i wore some other white crap, which is usually good, but crap with this. At school every1s 'cool multi color fashion show'. Anyways, to not be much of a problem I dont change the pants. I pay mrs. Devakran. We get the coats and the 'I WILL NEVER FIT ON YOUR HEAD UNTIL YOU CONQUER MY ELASTIC STRAP' caps. And go to the hall. So we werent able to eat coz we had to do the class photographs. And it felt relieving to throw the caps as well as 'movie like':P. However later on we did loadsa, personal photosessions with my fav teachers .. and came back home. 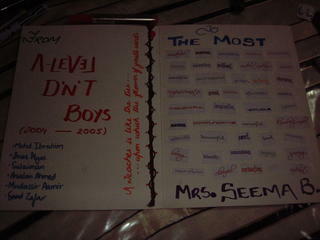 Which reminds me, Muddu and I gave Mrs. Seema Bhaumic the card. At first she thought it was just an ordinary card but when she opened it for the real thing, she was overwhelmed. Atleast what it seemed like. She kept dabbing her eyes to stop the tears and she didnt say a word, only smiled. She didnt cry either, but it was sure darn gonna burst. It was lovely, I was very happy. Thats the best I have ever felt, after making somone cry. Quote of the Day :- All great things are not better. PS: Somewhere in this post there is a picture of the card, I dont know where they placed it, but thats the card. the people and all .. *cough*all shites*cough* ..
Anyways, when are you leaving and how longs your stay? lol. Yeah 'the people and all' ... I'm leaving the 20th of July..I'll be back the 25th of August. I'll tell you, I'm pretty darn lucky this time. lol. Thank you very much. Good luck to you too. Which city are you going to by the way? EHhh...long stay or short stay, all you need is some luck. So GOOD LUCK!! - and InshAllah you'll have a great time there :) . Safe trip! hey...kya yaar...went there no word from u...dint even come online...temme is khi living upto ur expectation:P?